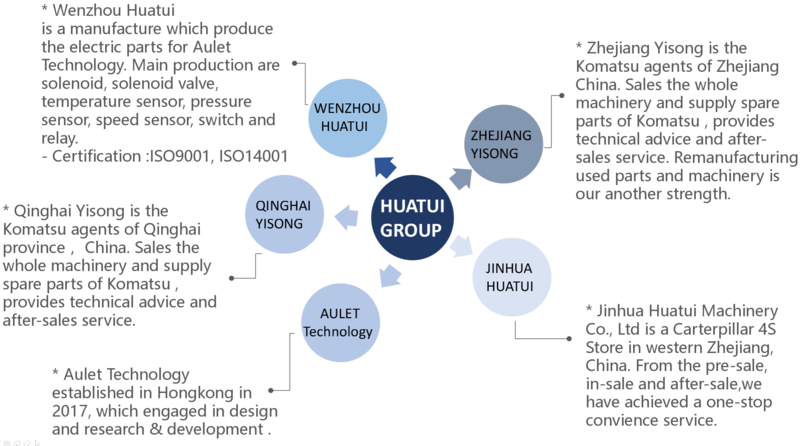 HUATUI GROUP, founded in 1986, is an organization consists of research & development, production and sales. HUATUI GROUP located in Zhejiang province, Qinghai province and Jiangxi province. We have set up branch companies in Wenzhou, Jinhua, Hangzhou, Lishui, Taizhou and other cities in China. 1989 START PRODUCING THE SOLENOID AND SOLENOID VALVE. CO-OPERATING WITH SHANXI HUANGHE CONSTRUCTION MACHINERY CO.,LTD. CO-OPERATING WITH SHANTUI CONSTRUCTION MACHINERY CO.,LTD. CO-OPERATING WITH CHINA CNHTC CHONGQING FUEL INJECTION SYSTEM CO.,LTD. 1993 CO-OPERATING WITH HEBEI XUANHUA CONSTRUCTION MACHINERY CO.,LTD. 1997 CO-OPERATING WITH SHANDONG LINGONG CONSTRUCTION MACHINERY CO.,LTD(SDLG). 2002 WENZHOU HUATUI MACHINERY CO.,LTD LISHUI BRANCH WAS FOUNDED. 2003 HANGZHOU HUATUI MACHINERY CO.,LTD TAIZHOU BRANCH WAS FOUNDED. FUDING HUATUI MACHINERY CO.,LTD WAS FOUNDED. HANGZHOU HUATUI MACHINERY CO.,LTD LINHAI BRANCH WAS FOUNDED. 2005 WENZHOU HUATUI MACHINERY CO.,LTD CHASHAN BRANCH WAS FOUNDED. 2017 JINHUA HUATUI MACHINERY CO.,LTD WAS FOUNDED. AULET TECHNOLOGY LIMITED WAS FOUNDED IN HONGKONG. JIANGXI HUATUI MACHINERY CO.,LTD WAS FOUNDED. 2003 WENZHOU KOMATSU CONSTRUCKTION MACHINERY CO.,LTD WAS FOUNDED. 2011 WENZHOU KOMATSU CONSTRUCTION MACHINERY CO.,LTD CHASHAN BRANCH WAS FOUNDED. 2012 WENZHOU KOMATSU CONSTRUCTION MACHINERY CO.,LTD BINGHAI BRANCH WAS FOUNDED. 2014 ALL OF WENZHOU KOMATSU CONSTRUCTION MACHINERY CO.,LTD. FINISHED RESOURCE INTERGRATION AS ZHEJIANG YISONG MACHINERY CO.,LTD. 2009 LISHUI、JINHUA、QUZHOU ENGINEING MACHINERY FINISHED RESOURCE INTERGRATION AS LISHUI TUOSHAN HEAVY INDUSTRY MACHINERY CO.,LTD. 2018 QINGHAI YISONG MACHINERY Co.,Ltd WAS FOUNDED ON 01.MARCH.